Samsung is at Gamescom 2017 with what it claims to be "the world's largest QLED gaming monitor". At the Cologne-based gaming event, open to the public from today until 26th August, Samsung is showing off its new CHG90 QLED Gaming Monitor. 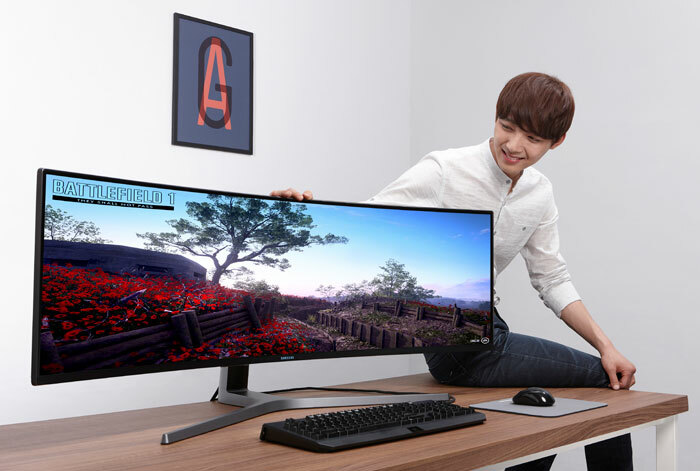 This monitor is 49-inches in diagonal, however it is very wide but not very tall (super ultra-wide 32:9), delivering what Samsung calls "an IMAX-style cinematic viewing experience". In another description Samsung says the screen is equivalent to two bezel-less 27-inch 16:9 monitors side by side - which is not just good for gaming but great for multi-tasking too. 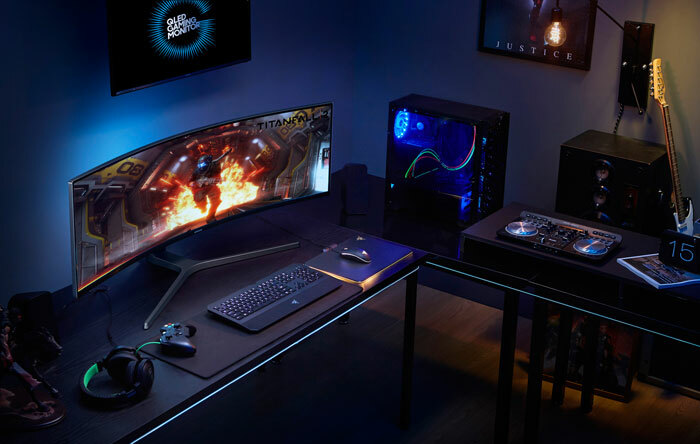 Looking through the tech specs of the Samsung CHG90 QLED Gaming Monitor reveals that the monitor sports a 3840 x 1080 pixel resolution across its 49-inches of screen real estate, and an 1800R curvature for immersive viewing. The CHG90's 32:9 HDR (High Dynamic Range) screen has a maximum 144Hz refresh rate but it can also operate happily at 60Hz or 120Hz settings. Samsung doesn't say if it supports FreeSync / Active Sync, but it is expected to do so. Gamers will also appreciate the 1ms response time and Game Mode options available via the monitor's OSD. A particular attraction of the new breed of QLED TVs and monitors are their 'best of both worlds' approach which blends QD (Quantum Dot) technology with OLED (Organic Light-Emitting Diode) technology. Samsung has its own QLED technology overview pages available for you to read further. If you have heard of QD displays before you will know that they have a reputation of lifelike but vibrant colours and the Samsung QLED displays build on this to enable various HDR image standards to be met. Samsung's easy settings controls allow end users to partition the screen or display multiple screens of different sizes with just one click. Furthermore, Picture-by-Picture functionality allows the viewing of multiple connected sources. For multiple connections the CHG90 provides; 2x HDMI and 1x DP and it also sports audio out ports. The monitor comes with a minimal black and silver stand which is said to be superlatively ergonomic, offering adjustments in height, swivel, and tilt. Alternatively the monitor can be VESA mounted. The Samsung CHG90 will be available throughout Europe after Gamescom 2017, however we don't have pricing information at this time. Exactly also a 21:9 much better when it comes to do in terms of productivity to gaming, because to me this looks like they just cut a 4K monitor in half and kept the bottom half for sale.